Promoting Brighton & Hove’s diverse club culture in support of the Disco loving LGBT community. Wonderland and Bass Levels, The Arch and Hideout, we’re celebrating Brighton’s most colourful weekend of the year! Three separate venues with all the glitter, summer and groove you need. There is no time to lose when it comes to partying, so that’s why we’ll be kicking off from midday. The Mesmerist will be hosting our first ever Wonderland rooftop terrace extravaganza, bringing you all the cocktails and carnival vibes that you desire. Wonderland is designed to take you on a magical journey, so we’ve got a stacked line up for the ultimate takeover by their very own residents. Expect to boogie with Sassy K (Sami Kubu) b2b Sandork (Sandor) b2b Creepy D (Wonderland founder) warming you up for our biggest show to date. We’re teaming up with Brighton’s TRICKSTAR Radio and Facebook Live to give you a full live stream of the event. Oh, and it’s FREE ENTRY! Following this, we will be relocating to the seafront, for the main Wonderland event. 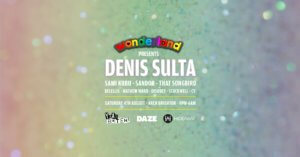 Watch the sunrise from The Arch with none other than the sassiest Denis Sulta to headline. Expect him to be spinning euphoric, on your feet, synth-laden tracks. To support, Sami Kubu and Sandor will be smashing out another appearance joined by That Songbird. Look forward to immersive, upbeat and deep summer grooves. We want to see your moves! House and Electronic music will be ricocheting from both inside and outside the venue as we’ve got YAAS B*TCH! Hosting the terrace. They’re bringing elaborate costumes, lots of sparkle and even more entertainment! It’s no wonder we have no advanced tickets left, but we’ve got your back, and there’ll be more for sale on the door. 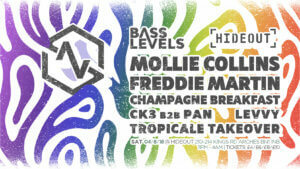 Breaking away from the feel-good vibes of House and Disco, Bass-Levels will be taking over Hideout Brighton’s intimate venue with headliners such as Mollie Collins and Freddie Martin. The glitz and glamour of PRIDE will be paired with DnB, UK Bass and UK Funky. So, how else are you going to finish pride with your fingers in the air?